Apple today seeded the second beta of an upcoming watchOS 2.2.1 update to developers, two weeks after seeding the first watchOS 2.2.1 beta and a month after releasing watchOS 2.2, a significant watchOS 2 update that introduced new features like multi-watch support for iPhones and Maps improvements. The second watchOS 2.2.1 beta can be downloaded through the dedicated Apple Watchapp on an iPhone by going to General --> Software update. To install the update, the Apple Watch must have 50 percent battery, it must be placed on the Apple Watch charger, and it must be in range of the iPhone. It's not yet clear what is included in watchOS 2.2.1, information provided by Apple in the first beta suggests it focuses on bug fixes and performance improvements, likely to address issues discovered since the release of watchOS 2.2. No obvious outward-facing changes were found in the first watchOS 2.2.1 beta, but we'll update this post should any new features be found in the second beta. Apple analyst Brian White of Wall Street firm Drexel Hamilton, who is currently on a Chinese tech tour, today issued a pair of research notes highlighting his upcoming Apple Watch and iPhone expectations through the end of 2016. Foremost, White cites a source who believes only the 5.5-inch iPhone 7 Plus will feature a dual camera system, echoing the same prediction made by often-accurate KGI Securities analyst Ming-Chi Kuo earlier this week. The analyst claims that iPhone 7 production is expected to begin in July, and the next-generation smartphone is expected to help Apple and its suppliers return to smartphone growth in the second half of 2016, just months after the iPhone likely experienced its first year-over-year quarterly sales decline ever. Apple announces its Q2 2016 earnings resultson Monday, April 25 at 2:00 p.m. Pacific.Our meeting with a tech supply chain company highlighted a rough end to 2015 with significant forecast reductions from Apple; however, forecasts have been stable since then with 2Q:16 expected to be the trough. After a YoY sales decline in 1Q:16, our contact expects to return to growth in H2:2016. Production of parts of the iPhone 7 are expected to begin in July.Meanwhile, White predicts that the Apple Watch could be refreshed within the next two to three months. Apple Watch shipments will decline more than 25 percent year-over-year in comparison to 2015, according to a new research note issued by KGI Securities analyst Ming-Chi Kuo. The wearable device sold an estimated 10.6 million units in eight months last year, but Kuo predicts that even with the launch of the Apple Watch 2, and a full twelve months of sales, the device's shipments will still come in at less than 7.5 million units in 2016. The analyst describes an "immature wearable device market" and a few key lacking features of the first-generation Apple Watch -- iPhone independency, no killer app, limited battery life, etc. -- that will contribute to its overall sales decline prior to the launch of the second-generation version. Kuo believes that the Apple Watch 2 will enter mass production in the third quarter of 2016, in line with a fall launch alongside the iPhone 7, so its overall contribution to shipping numbers for the year is predicted to be limited. Apple today seeded the first version of an upcoming watchOS 2.2.1 update to developers, just over two weeks after releasing watchOS 2.2, a significant watchOS 2 update that introduced new features like multi-watch support for iPhones and Maps improvements. The 2.2.1 beta can be downloaded through the dedicated Apple Watch app on an iPhone by going to General --> Software update. To install the update, the Apple Watch must have 50 percent battery, it must be placed on the Apple Watch charger, and it must be in range of the iPhone. It's not yet clear what is included in watchOS 2.2.1, but Apple's release notes say it includes bug fixes and performance improvements, likely for issues discovered since the release of watchOS 2.2. We'll update this post with any new changes that are discovered in the watchOS 2.2.1 beta. A trio of Apple inventions published Thursday detail advanced strap designs with embedded electronic devices that connect via Apple Watch's diagnostics port, suggesting the wearable might soon support wireless charging battery packs, GPS receivers and more. The patent applications, published by the U.S. Patent and Trademark Office, offer an intriguing taste of a modular hardware ecosystem created to extend Apple Watch functionality well beyond its current limitations. Instead of building sensor stacks, processors and other complex — and power hungry — components directly into a single chassis, Apple proposes a breaking those units out into a wide range of devices sold as watch band links, electrically connected in series or parallel. As described in Apple's "Modular functional band links for wearable devices" application, modular designs present a flexible platform onto which users can add on the features, or hardware nodes, they want most. This level of customization promises optimized power consumption and a lean internal layout, two valuable commodities in a miniature computing platform. 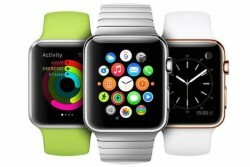 Like any multifunction device, Apple notes Apple Watch can support accessories enabling a slew of value-added functionality, the most interesting being batteries, displays, processors, electricity generators, GPS sensors, cameras, thermometers, blood pressure sensors, sweat sensors and speakers. Arranged as links, the standalone devices connect to each other and ultimately to the 6-pin diagnostics port on Apple Watch.